Workplace comedies are NBC's forte. Dating all the way back to Cheers to The Office to Parks & Recreation, NBC was once the biggest and most critically acclaimed network for comedy. This has now all changed to the point where almost every new sitcom NBC premieres is somewhere between a complete flop to a moderate failure and none have garnered any noteworthy critical acclaim. Is NBC's woeful sitcom situation about to change with their new workplace comedy Superstore...? The premise and setting of Superstore is quite simple. It follows the work lives of a group of diverse employees at a big box superstore called 'Cloud 9' (that sounds familiar). Ugly Betty alum America Ferrera stars in the lead role as Amy, a 10-year veteran Cloud 9 associate who is now a floor supervisor. If you're expecting Amy to be anything like the optimistic, bright and bubbly Betty character you all know and love from Ugly Betty, you'd be disappointed. Amy is stoic and serious character who clashes with new employee Jonah (Ben Feldman). Other employees include Dina (Lauren Ash), Cloud 9's assistant store manager who has a crush on associate Jonah. Garret (Colton Dunn), who is paraplegic, Mateo (Nico Santos), the bitchy and ambitious new associate. Cheyenne (Nichole Bloom) who is pregnant and Glenn (Mark McKinney) the store's seemingly absent minded and fairly meek store manager. The first five episodes of Superstore have all made something extremely clear. The show is aiming to be quirky, which is great for audiences who enjoy watching odd little shows but unfortunate for a network which desperately needs big ratings in a TV landscape which extends the life of a show based on the number of eyeballs it attracts each week. 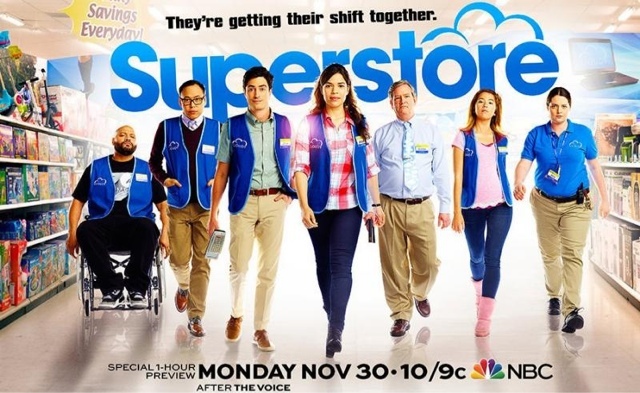 That's not to say Superstore doesn't have the potential to become a popular show, it seems Superstore may be the next Community; a low rated but loved cult show. Superstore certainly doesn't force its quirk. The performance of stand-outs Lauren Ash and Mark McKinney, along with the juxtaposed happy tone within the store and the meticulous undertone of doing the exact same job everyday evoke a slight off-beat atmosphere to the show. Even the vignettes which suture scenes together can be comically dark. Pilot director Ruben Fleisher and production designer Aaron Osbourne have done an amazing job converting the world of a busy superstore into a bright and welcoming environment which is packed with visual gags, quick jokes and funny interactions between customers. The Cloud 9 set is a character in itself and helps to add an oddball element to the show. It's pretty obvious Jonah and Amy will become a couple by the end of the season but, creator and The Office writer Justin Spitzer is so far doing a great job building a love-hate relationship between the two slowly. Feldman excels when playing the understated and quirky leading man and works well with Fererra, whose role is the polar opposite to the role which made her a star. One of the standout episodes is from the initial five is episode two, "Magazine Profile". 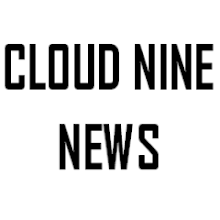 A reporter (Eliza Coupe) visits Cloud 9 to do an article on the store for the inter-company magazine. McKinney is at his best when Glenn is placed in sticky situations in which we see his innocence and eagerness to please, which is contrasted by the tainted and gruff Dina, who will clearly go to great lengths to prevent another woman (in this case, Eliza Coupe) from getting their paws on her man. The episode marks the first step in making the diverse and already promising ensemble cast even better by presenting their eccentric characteristics and how these characteristics complement or cause conflict with each other. 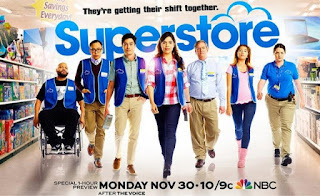 While Superstore's ensemble has the potential to become a even funnier bunch as they come together as episodes progress, it will be interesting where Spitzer takes the series next. Most episodes have focused on the annoying Cloud 9 customers and how the employees deal with these customers. Will we see an episode focusing on an employee party? Or maybe their lives outside Cloud 9? To make the show stronger, the ensemble must be stronger and the only way to do that is to develop their relationships further by focusing on the inter-personal relationships of the employees in the workplace. Superstore is a super promising show, and has the potential to become a benchmark, quirky and eccentric workplace comedy which NBC desperately needs. It has all the right characters, and intriguing plots, now it just needs to figure out how to use them. UPDATE: Hooorayyy! Superstore has been renewed for a second season by NBC! This show surprised as it turned into something great! Let's hope it doesn't change too much in season 2! Power Rangers Season 26 Confirmed! Jane The Virgin to end after Season 5! It’s official. The CW just announced that the upcoming fifth season of Jane The Virgin will be its last. What Will Happen to Fox? The Shona Rhimes formula is harder to capture than originally thought, isn't it? I really wanted to like NBC's new musical drama.